"Room was luxurious and was a good place to stay before our adventure." "I love the peace and tranquility of this lodge. Beware mosquitoes and I'm pretty sure that I saw a mouse or similar in our chalet at night." "Pitched just right - not over the top luxurious but very comfortable with great views over the river. The dinner we had was good as was the breakfast. We didn't use the pool but it did look a bit on the small side. Staff were friendly and helpful. 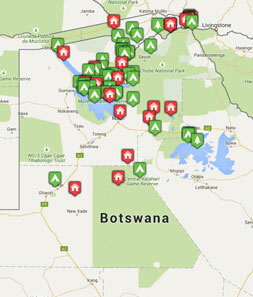 Would recommend this lodge as a good start or finish to a safari holiday." "A very comfortable room in attractive grounds and setting beside the river. The water, coloured brown from the tannin in the local supply wasn\'t a highlight but inevitable and the laundry I had done was returned in good order and very promptly. I didn\'t have dinner in the restaurant but the breakfast was OK."
"A nice place to relax after the journey to Botswana. Staff were welcoming. The room was good although there was some work going on behind our chalet in the morning which intruded on our privacy a little. The food was good."